Shine some light above your bedside table, in your hallway, or even in your bathroom with the versatile Ball wall lamp. 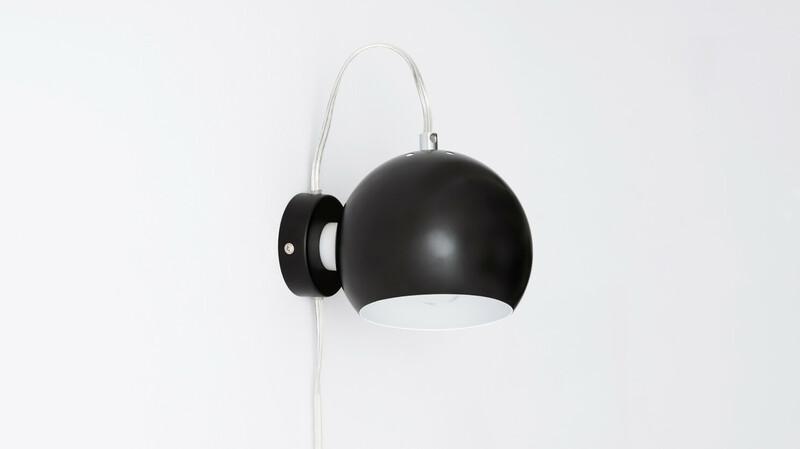 Powder-coated black metal with a matte finish, the ball head is magnetically attached to the base, allowing for it to be easily removed and positioned as necessary in your room. The Ball wall lamp comes with a cord and plug application, but also the option for hardwiring. Wipe clean with a soft, dry cloth. Do not use harsh abrasives or household cleaners as they may damage the product. In-stock EQ3 accessories and small furniture items (nightstands, end tables, etc.) will be delivered in 5-10 business days, using FedEx Ground®. Please note that FedEx delivers Monday to Friday during regular business hours (usually between 9AM-5PM local time). View complete EQ3 Shipping & Delivery and EQ3 Return & Exchanges. This product does not require assembly.